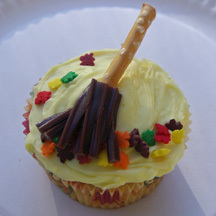 Celebrate fall with these easy cupcakes that pair an edible rake with falling leaves. They’re great for harvest festivals and other autumn events. What You Need: 1 cupcake; yellow frosting; stick pretzel; chocolate Twizzler; leaf-shaped sprinkles (such as by Wilton); scissors or kitchen shears. This entry was posted on Sunday, November 15th, 2009 at 12:04 pm	and is filed under fall cupcakes, nature cupcakes, Thanksgiving cupcakes. You can follow any responses to this entry through the RSS 2.0 feed. Responses are currently closed, but you can trackback from your own site.